“A day without a FRIEND is like a pot without a single drop of HONEY left inside.” Christopher Robin, encounters his childhood friend Winnie-the-Pooh, who helps him to rediscover the joys of life. A whole new adventure with Winnie the Pooh, Piglet, Eeyore, and Tigger is right around the corner. Disney's Christopher Robin starts Friday, August 3rd. 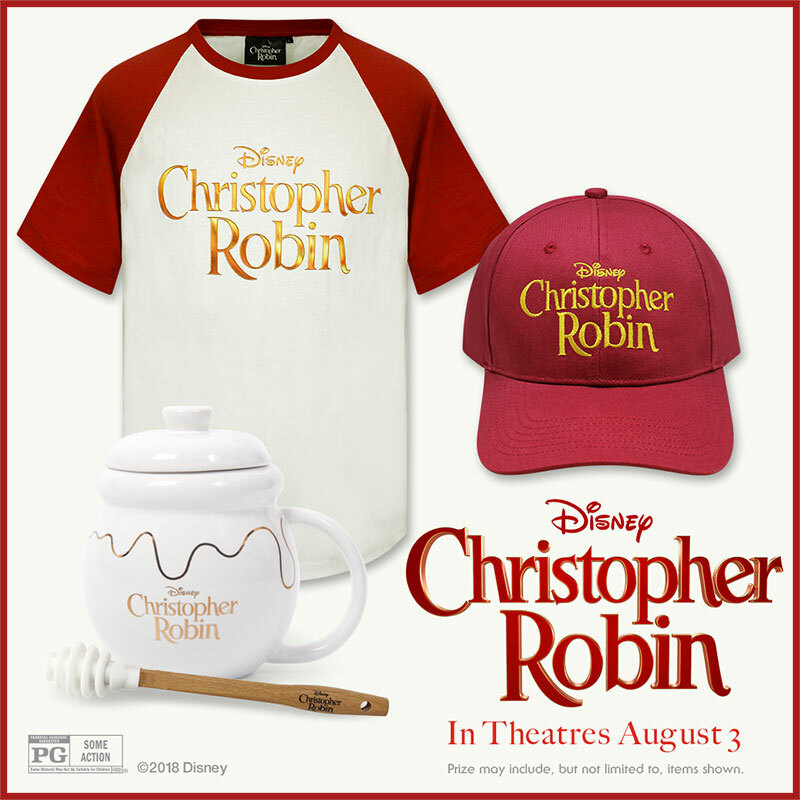 We are giving away TWO official Christopher Robin prize packs! *Prize may include, but not limited to items shown. 1. Submit your information in the form below for a chance to win. Contest opens Wednesday, August 1 and ends on Sunday, August 19 at 11:59PM PST. The winner will be notified by email on Monday, 8/20 and will have 48 hours to claim prize before forfeiting. 2. Here’s another reason to be cheery... Follow the link below to our Facebook page and discover another chance to win! No purchase necessary. Both contests end on Sunday, 8/19/18 at 11:59PM PST and winners announced Monday, 8/20/18. Facebook Contest: One lucky winner will be selected at random. We will leave a comment on the winning post, so be sure to check notifications. Winner has 48 hours to claim prize before forfeiting. Website Contest: One lucky winner will be selected at random. Winner will be notified via email and has 48 hours to claim prize before forfeiting. Click Here & Enter the Facebook Contest! 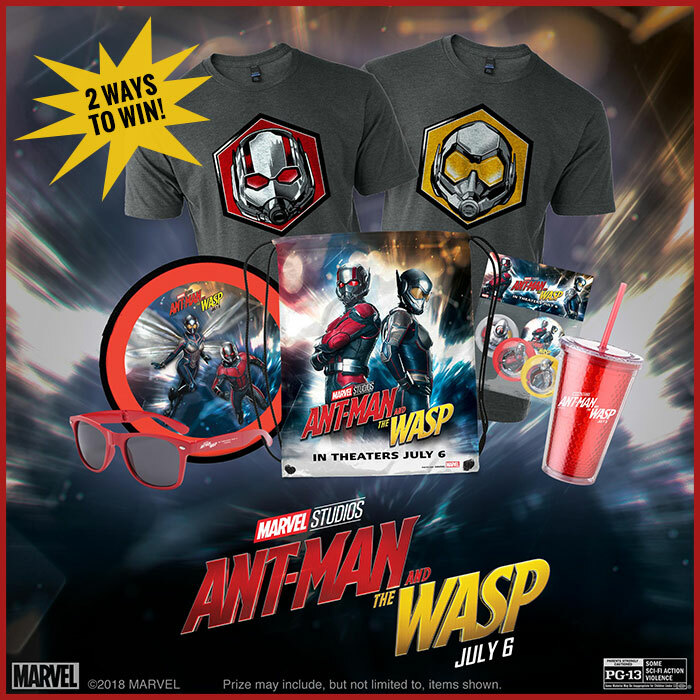 We are giving away TWO official Ant-Man and The Wasp prize packs! 1. Submit your information in the form below for a chance to win. Contest opens Thursday, July 5 and ends on Wednesday July 18 at 11:59PM PST. The winner will be notified by email on Thursday and will have 48 hours to claim prize. 2. Then, try your luck again… Follow the link below to our Facebook page and discover another chance to win! No purchase necessary. Both contests end on Wednesday 7/18/18 at 11:59PM PST and winners announced Thursday 7/19/18. Feeling Incredibly lucky? You have TWO chances to win an Incredibles 2 prize pack! The Incredibles are back in action at the drive-in this Friday, June 15th. Just like old times, huh Bob? 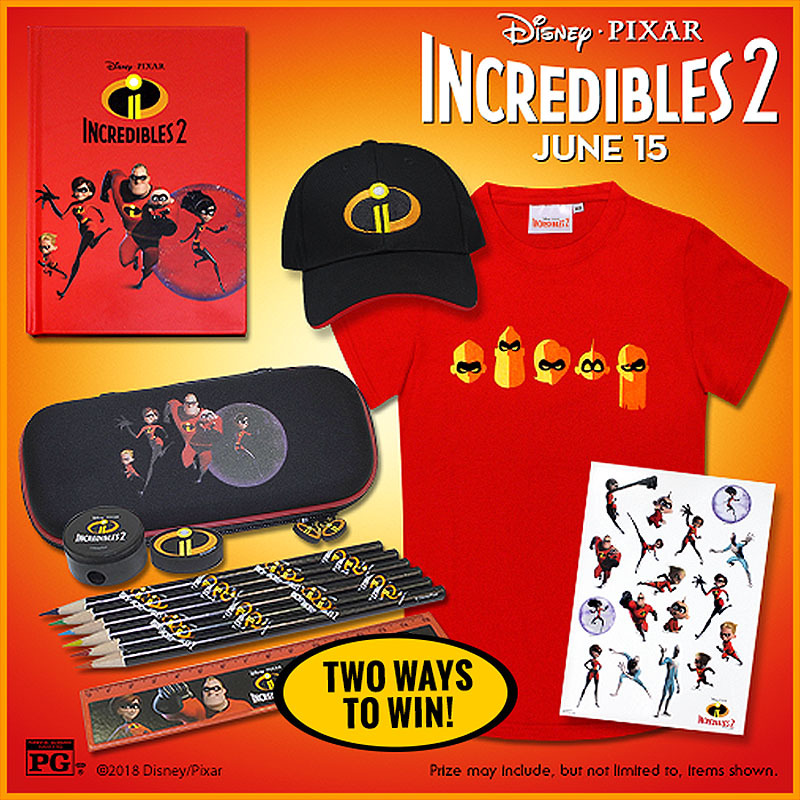 We are giving away TWO official Incredibles 2 prize packs! 1. Submit your information in the form below for a chance to win. Contest opens Wednesday, June 13 and ends on Wednesday June 27 at 11:59PM PST. The winner will be notified by email on Thursday and will have 48 hours to claim prize. 2. Double up on your luck… Follow the link below to our Facebook page and discover another chance to win! No purchase necessary. Both contests end on Wednesday 6/27/18 at 11:59PM PST and winners announced Thursday. Website Contest: One lucky winner will be selected at random. Winner will be notified via email and has 48 hours to claim prize. Facebook Contest: One lucky winner will be selected at random. We will leave a comment on the winning post, so be sure to check notifications. Winner has 48 hours to claim prize. 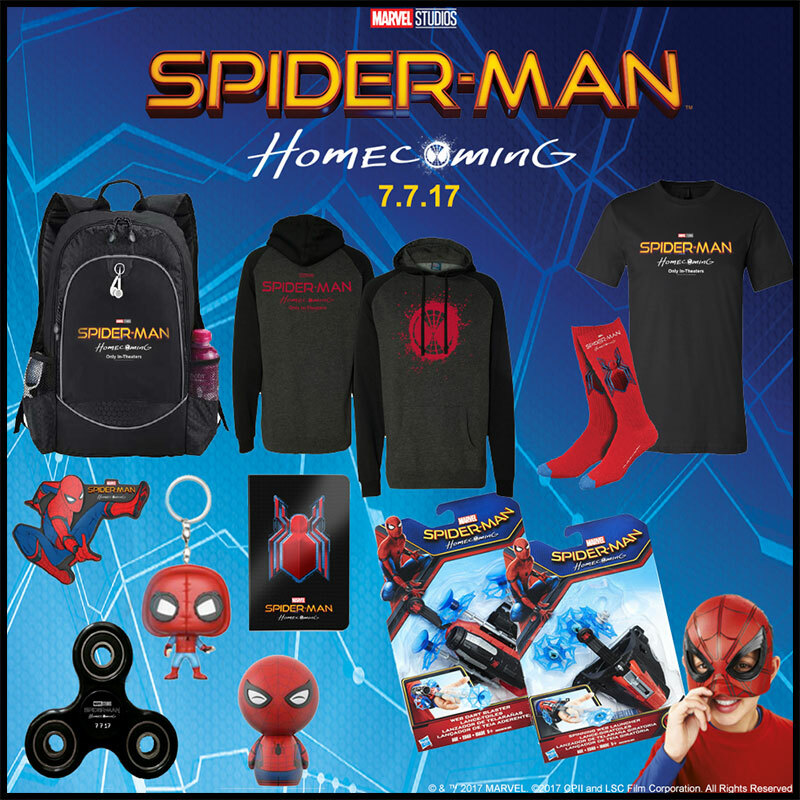 Prizes are from a variety of movies and could include official promotional items from: Black Panther, Captain America Civil War, Cars 3, Chips, Ice Age, LEGO Ninjago Movie, Moana, Pirates of the Caribbean Dead Men Tell No Tales, Sausage Party, Spiderman Homecoming, The Boy, The Jungle Book, Thor Ragnarok, Trolls, Zootopia and more. Prize box is literally filled to the top with prizes… seven or more items! 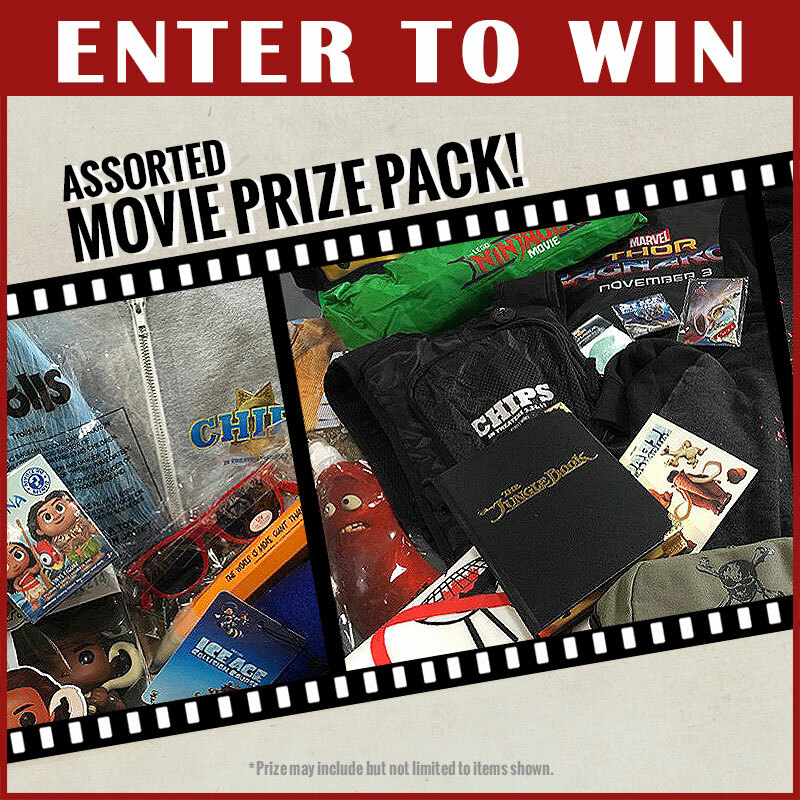 *Each prize pack is a selection of items shown and not limited to items shown. No Purchase Necessary. One entry per email address. Contest opens Monday, 4/18/18 and ends on Tuesday 5/15/18 at 11:59PM PST. One lucky winner will be selected at random. The winner will be notified via email on Wednesday and has 48 hours to claim prize. Good luck! Wakanda Forever! When two foes conspire to destroy Wakanda, a king will rise. Black Panther will reign at the drive-in this Friday, February 16th! 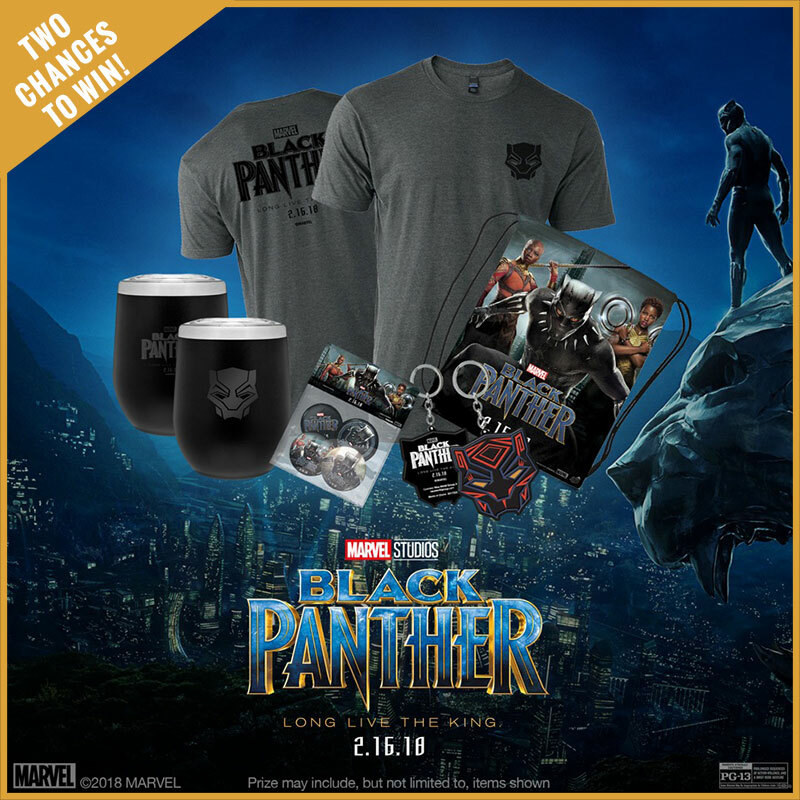 We are giving away an official Black Panther prize pack*! 1. Submit your information in the form below for a chance to win. Contest opens Wednesday, February 14 and ends on Sunday, March 4th at 11:59 PM PST. The winner will be notified by email on Monday and will have 48 hours to claim prize. 2. The king is generous!... Follow the link below to our Facebook page and discover another chance to win! No purchase necessary. Both contests end on Sunday 3/4/18 at 11:59 PM PST and winners announced Monday. Are you ready to bring down the hammer? Thor: Ragnarok hits the drive-in Friday, November 3rd! 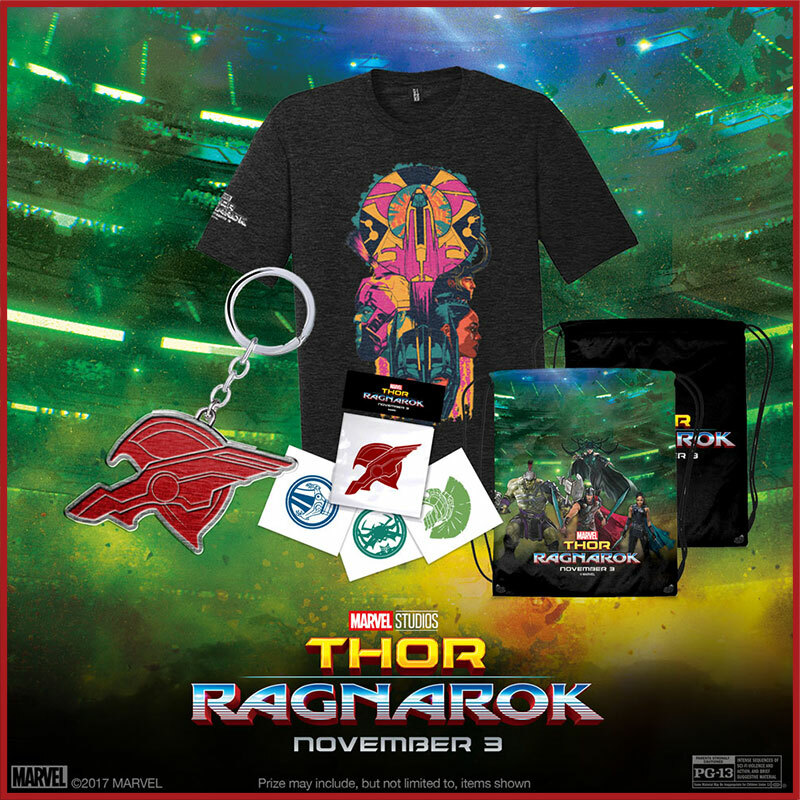 We are giving away an official Thor: Ragnarok prize pack*! Submit your information below for a chance to win. Contest opens Wednesday, November 1st and ends on Sunday, November 19th at 11:59 PM PST. The winner will be notified by email on Monday and has 48 hours to claim prize. Wait, destiny may have other plans for you... Follow the link below to our Facebook page and discover another chance to win! No purchase necessary. Both contests end on Sunday 11/19/17 at 11:59 PM PST and winners announced Monday. Is your Spider-Sense tingling? That’s because you have 2 chances to win a SUPER Spider-Man Homecoming prize pack*! Spider-Man: Homecoming swings into action at the drive-in Friday, July 7th. 1. Submit your information below for a chance to win. 2. Follow the link below and enter the Facebook contest. *Prize is an assortment of 5-6 items shown. Prize may include, but not limited to items shown. No purchase necessary. Website Contest Details: Submit your info on the form below for a chance to win. One entry per email address. Contest ends on Sunday 7/23/17 at 11:59 PM PST. One lucky winner will be selected at random and announced on our website on Monday! Winner will be notified via email and has 48 hours claim prize. Facebook Contest Details: Follow the link below to the Facebook contest. Comment and/or tag a friend on the post and you could win. Contest ends on Sunday 7/23/17 at 11:59 PM PST. One lucky winner will be selected at random and announced on our website on Monday! We will leave a comment on the winning post, so be sure to check notifications. Winner has 48 hours claim prize. Assemble ye crew ’n get ready to step aboard The Dying Gull… t'is gonna be a wild ride! Dead Men Tell No Tales sails into the drive-in this Friday, May 26! We are giving away an official Pirates of the Caribbean prize pack*! Submit your information below for a chance to win. Contest opens Tuesday, May 23 and ends on Monday, June 12th at 11:59 PM PST. The winner will be notified by email on Tuesday and has 48 hours to claim prize. Ahoy, Mateys! 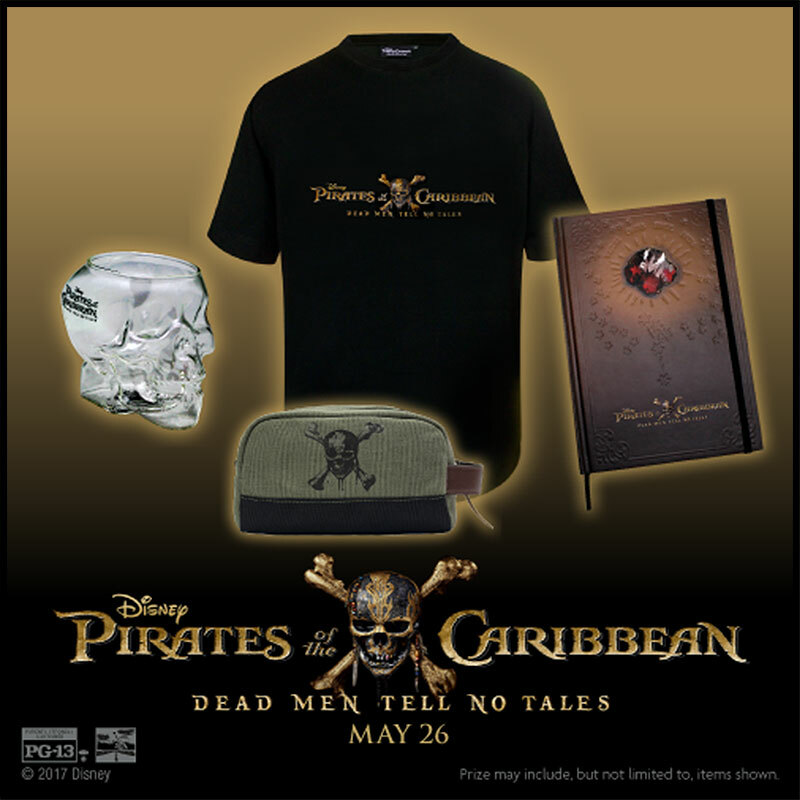 T'is yer lucky day... Thar be two ways to win this Pirates of the Caribbean: Dead Men Tell No Tales treasure!! Follow the link below to our Facebook page and discover another chance at this Pirate’s loot! No purchase necessary. Both contests end on Monday 6/12/17 at 11:59 PM PST and winners announced Tuesday. Facebook Contest: One lucky winner will be selected at random. We will leave a comment on the winning post, so be sure to check notifications. Winner has 48 hours claim prize. Website Contest: One lucky winner will be selected at random. Winner will be notified via email and has 48 hours claim prize. A movie so BIG, you don’t want to wait to see it at the drive-in… Kong Skull Island starts Friday, March 10. 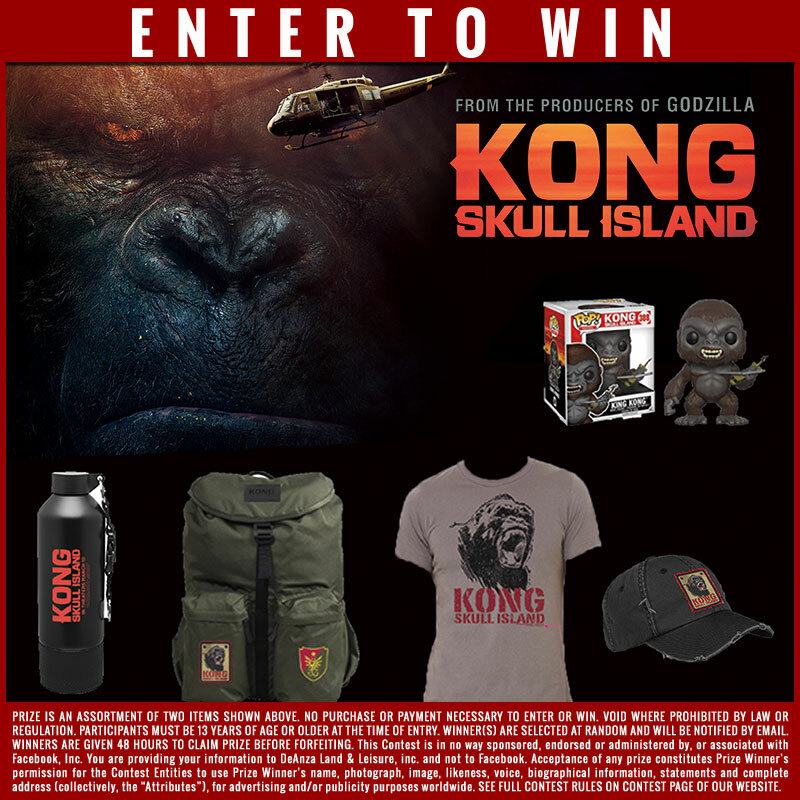 We are giving away an official Kong Skull Island Prize! Submit your information below for a chance to win. Contest opens Tuesday, March 7 and ends on Tuesday, March 21 at 11:59 PM PST. The winner will be notified by email on Wednesday, March 22, and will have 48 hours to claim their prize. Be sure to add info@vanburendriveintheatre.com to your address book to ensure our emails make it to your inbox! They sing and dance, they are delightful and… delicious?! After the Bergens invade Troll Village, Poppy, the happiest Troll ever born, and the curmudgeonly Branch set off on a journey to rescue her friends. Trolls opens at the drive-in Friday, November 4. 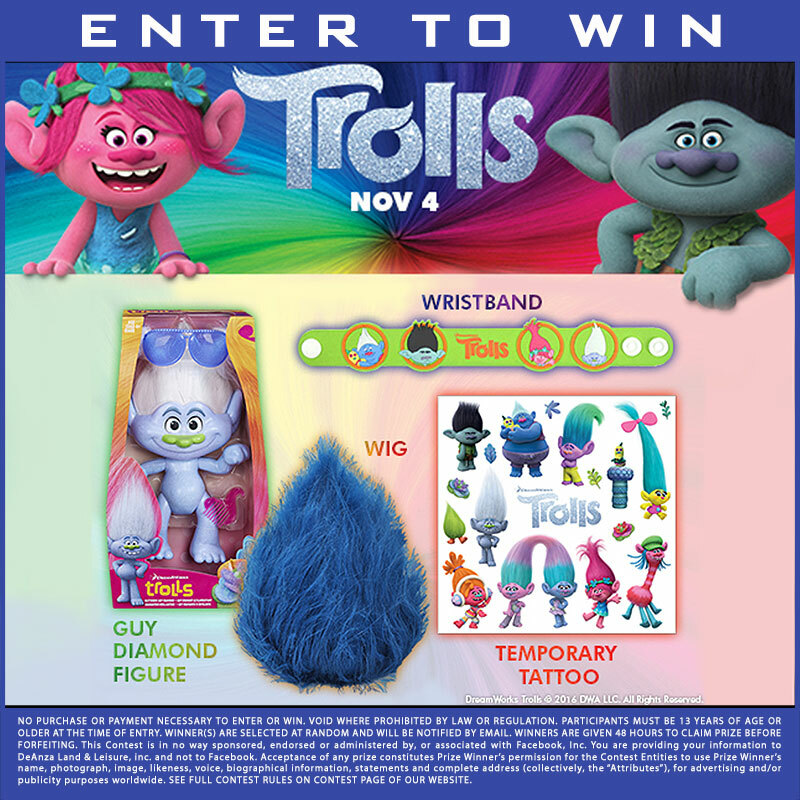 We are giving away an official Trolls Prize Pack*! Submit your information below for a chance to win. Contest opens Thursday, November 3 at 12:00AM EST and ends on Wednesday, November 16 at 11:59 PM EST. The winner will be notified by email on Thursday, November 17, and will have 48 hours to claim their prize. *Prize packs are not limited to items shown.